On September 19th, Dr. Ken Freedman visited us to give us a speech about backpack safety, including the proper weight of the backpack, the size backpack that should be worn, and the correct way to wear it so we all don’t get hurt. Everybody enjoyed it so much we all stopped talking! It was a fun meeting. 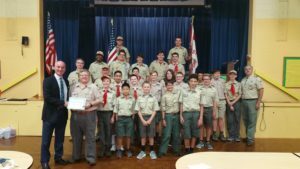 The picture is the troop giving Dr. Ken a troop certificate. Thank you Dr. Ken for keeping us all stay safe when we are using our backpacks. This entry was posted in Historian, Troop News. Bookmark the permalink. I loved visiting Troop 223! It is a fine group of scouts at every level of scouting, guided by a dedicated, caring group of leaders. Your meeting was run impressively. Thank you very much for making me feel so welcome and for being very attentive. Use what I have shown you so you will BE PREPARED on the trails of life.